Welcome to your Troop 92's new website! 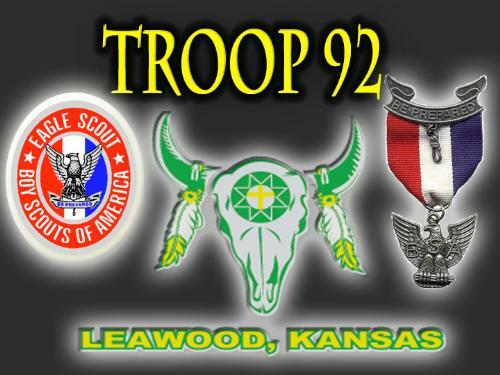 Troop 92 was founded in 1992. Our chartering organization is the United Methodist Church of the Resurrection. We meet at the church at 13720 Roe, Leawood, Kansas on Monday evenings. We meet upstairs of the Building B at 7pm. The troop serves southern Johnson County, Kansas, including the cities of Overland Park and Leawood. 04/29/19 All Scouts MUST complete and turn in their Summer Camp Outpost request forms. This form is needed for every scout, If NO Outpost is being requested, please indicate on the form, have your sons name on it and turn it in so we know they didn’t forget to sign up. Members of Advancement and Programs will be at the meeting to answer any questions you have. Forms are on Troop website. We suggest you take a picture of your sons completed form they turn in, in case we have to make a change you will have it when we contact you. Summer Camp parent meetings will be held on April 29th & May 6th (You must attend one of the two, not both). These mandatory meetings will be held in Wesley Chapel during the regular Monday night meeting time. You are asked to bring in health form C signed by a physician, we will be reviewing logistics for camp, discussing code of conduct forms, review what to bring and importantly what NOT to bring to camp. This is not just for families new to camp, these meetings are intended for all families who have a scout attending camp with us this summer. Please see the email below requesting volunteers to staff at Scout Rotary Camp this summer. We have had several boys from the troop volunteer in the past and while hard work, it was rewarding and provides service hours. Scouts must be 14 or older to be considered. Deadline for registration and payment of final fees for summer camp is 7:00PM April 15, 2019. This is a hard deadline to avoid late fees for registration. If your Scout is interested in volunteering for the SevenDays walk on April 15, please contact Tony Corporon directly (acorporon@hotmail.com) as soon as possible so he can register your Scout. As you may know, on April 13, 2014, my father and nephew were murdered by a self-described white supremacist at the Jewish Community Center. In the wake of that tragedy, we established the Faith Always Wins Foundation and an annual awareness and fundraiser event, SevenDays. SevenDays 2019 will occur April 9-15, culminating in a Walk at the Liberty Memorial on the 15th.